The recent meteoric rise in the dollar price of Bitcoin – from around $12 at the beginning of 2013 to several peaks above $1000 at the end – has brought widespread attention to the prospects for and future of cryptocurrencies. I have no material stake in Bitcoin (although I do accept donations), and this article will not attempt to predict whether the current price of Bitcoin signifies mostly lasting value or a bubble akin to the Dutch tulip mania of the 1630s. Instead of speculation about any particular price level, I hope here to establish a principle pertaining to the purchasing power of cryptocurrencies in general, since Bitcoin is no longer the only one. Although Bitcoin, developed in 2009 by the pseudonymous Satoshi Namakoto, has the distinction and advantage of having been the first cryptocurrency to gain widespread adoption, others, such as Litecoin (2011), Namecoin (2011), Peercoin (2012), and even Dogecoin (2013) – the first cryptocurrency based on an Internet meme – have followed suit. Many of these cryptocurrencies’ fundamental elements are similar. Litecoin’s algorithm is nearly identical to Bitcoin (with the major difference being the fourfold increase in the rate of block processing and transaction confirmation), and the Dogecoin algorithm is the same as that of Litecoin. The premise behind each cryptocurrency is a built-in deflation; the rate of production slows with time, and only 21 million Bitcoins could ever be “mined” electronically. The limit for the total pool of Litecoins is 84 million, whereas the total Dogecoins in circulation will approach an asymptote of 100 billion. The deflationary mechanism of each cryptocurrency is admirable; it is an attempt to preserve real purchasing power. With fiat paper money printed by an out-of-control central bank, an increase in the number and denomination of papers (or their electronic equivalents) circulating in the economy will not increase material prosperity or the abundance of real goods; it will only raise the prices of goods in terms of fiat-money quantities. Ludwig von Mises, in his 1912 Theory of Money and Credit, outlined the redistributive effects of inflation; those who get the new money first (typically politically connected cronies and the institutions they control) will gain in real purchasing power, while those to whom the new money spreads last will lose. Cryptocurrencies are independent of any central issuer (although different organizations administer the technical protocols of each cryptocurrency) and so are not vulnerable to such redistributive inflationary pressures induced by political considerations. This is the principal advantage of cryptocurrencies over any fiat currency issued by a governmental or quasi-governmental central bank. Moreover, the real expenditure of resources (computer hardware and electricity) for mining cryptocurrencies provides a built-in scarcity that further restricts the possibility of inflation. Yet there is another element to consider. Virtually any major cryptocurrency can be exchanged freely for any other (with some inevitable but minor transaction costs and spreads) as well as for national fiat currencies (with higher transaction costs in both time and money). For instance, on January 12, 2014, one Bitcoin could trade for approximately $850, while one Litecoin could trade for approximately $25, implying an exchange rate of 34 Litecoins per Bitcoin. Due to the similarity in the technical specifications of each cryptocurrency (similar algorithms, similar built-in scarcity, ability to be mined by the same computer hardware, and similar decentralized, distributed generation), any cryptocurrency could theoretically serve an identical function to any other. (The one caveat to this principle is that any future cryptocurrency algorithm that offers increased security from theft could crowd out the others if enough market participants come to recognize it as offering more reliable protection against hackers and fraudsters than the current Bitcoin algorithm and Bitcoin-oriented services do.) Moreover, any individual or organization with sufficient resources and determination could initiate a new cryptocurrency, much as Billy Markus initiated Dogecoin in part with the intent to provide an amusing reaction to the Bitcoin price crash in early December 2013. This free entry into the cryptocurrency-creation market, combined with the essential similarity of all cryptocurrencies to date and the ability to readily exchange any one for any other, suggests that we should not be considering the purchasing power of Bitcoin in isolation. Rather, we should view all cryptocurrencies combined as a single pool of wealth. The total purchasing power of this pool of cryptocurrencies in general would depend on a multitude of real factors, including the demand among the general public for an alternative to governmental fiat currencies and the ease with which cryptocurrencies facilitate otherwise cumbersome or infeasible financial transactions. In other words, the properties of cryptocurrencies as stores of value and media of exchange would ultimately determine how much they could purchase, and the activities of arbitrageurs among the cryptocurrencies would tend to produce exchange rates that mirror the relative volumes of each cryptocurrency in existence. 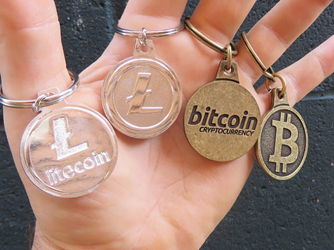 For instance, if we make the simplifying assumption that the functional properties of Bitcoin and Litecoin are identical for the practical purposes of users, then the exchange rate between Bitcoins and Litecoins should asymptotically approach 1 Bitcoin to 4 Litecoins, since this will be the ultimate ratio of the number of units of these cryptocurrencies. Of course, at any given time, the true ratio will vary, because each cryptocurrency was initiated at a different time, each has a different amount of computer hardware devoted to mining it, and none has come close to approaching its asymptotic volume. What implication does this insight have for the purchasing power of Bitcoin? In a world of many cryptocurrencies and the possibility of the creation of new cryptocurrencies, a single Bitcoin will purchase less than it could have purchased in a world where Bitcoin was the only possible cryptocurrency. The degree of this effect depends on how many cryptocurrencies are in existence. This, in turn, depends on how many new cryptocurrency models or creative tweaks to existing cryptocurrency models are originated – since it is reasonable to posit that users will have little motive to switch from a more established cryptocurrency to a completely identical but less established cryptocurrency, all other things being equal. If new cryptocurrencies are originated with greater rapidity than the increase in the real purchasing power of cryptocurrencies in total, inflation may become a problem in the cryptocurrency world. The real bulwark against cryptocurrency inflation, then, is not the theoretical upper limit on any particular cryptocurrency’s volume, but rather the practical limitations on the amount of hardware that can be devoted to mining all cryptocurrencies combined. Will the scarcity of mining effort, in spite of future exponential advances in computer processing power in accordance with Moore’s Law, sufficiently restrain the inflationary pressures arising from human creativity in the cryptocurrency arena? Only time will tell.